The Pond at the NCMA is both a recreational facility and an ecological system. The project is a combined BMP that includes bio-retention, constructed wetlands, and open water to create multi-phase water treatment feature. Paths are designed to fit within the overall NCMA trail system and weave around the pond as part of the “Blue Loop”, a program sponsored by the Blue Cross and Blue Shield Foundation of NC that encourages exercise. Accessible paths weave through the lush landscape, allowing visitors to enjoy the plants and wide open space. Jesse Turner, PLA, ASLA Lift[ED] Director, was the Project Manager for the initial installation while working at another firm. During the first five years of growth, some of the plant life in the upper terrace fell into disrepair due to a lack of maintenance. In 2015 Lift[ED] was contacted by the NCMA to provide follow-up design services to renovate the upper terrace of the bio-retention area, with the goals of creating a planting scheme that provided water quality benefits and easy maintenance. The pond at the NCMA has been studied by North Carolina State University’s Stormwater Engineering Group and found to be effective at increasing water quality. This was achieved by allowing water during various rain events to filter through bio-retention terraces that are filled with vigorous native plants. In turn, these plants provide habitat for a multitude of naturally occurring species such as red tailed hawk, crayfish, and many pollinator insects for a low impact, high result solution. In addition to design services, Lift[ED] coordinated with local volunteers, including a dedicated group of retiree volunteers, and the public at large to better understand ongoing maintenance needs. Lift[ED] conducted meetings to gather feedback and developed a management guidebook that assists volunteers in understanding how to care for the landscape effectively. Fish Family Play Area is on the edge of downtown Houston, TX. A part of the Buffalo Bayou Partnership's larger vision to restore the banks of the Bayou, this park creates opportunities for the youngest park visitors to play. The park design, led by SWA Group, provides nature play opportunities for young children and care providers in a safe contained environment. Nearby, the larger landscape of the bayou is waiting for these young visitors to begin exploring as they gain more independent movement as young adults. Jesse Turner, as Design Coordinator for the Natural Learning Initiative, worked closely with SWA Group on the design and specification of materials for the park. His expertise in planning and designing public spaces for children and families was critical in the development of this detailed park. The Down East Discovery Park is a multi-use space that serves as a early childhood outdoor learning environment demonstration site and a community gathering space. Owned by the Down East Partnership for Children, the park is frequently used for events that support their work with local schools that focus on early childhood education. Jesse Turner, while Design Coordinator at The Natural Learning Initiative, worked with the DEPC team to develop the design program and prepare the schematic design for the park. We worked with Paul Horne, Pittsboro Parks Planner, to renovate an existing landscape entrance between Mary Hayes Barber Holmes (MHBH) Park and an adjacent residential development. 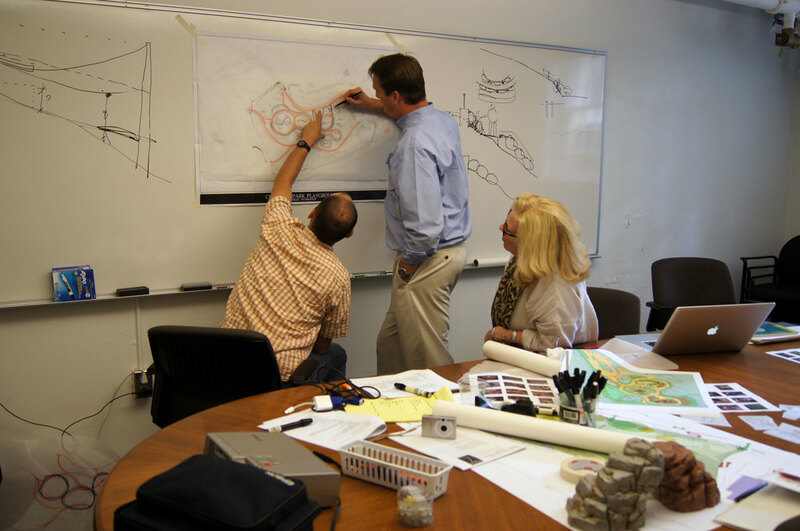 We provided sketch drawings for initial concept design and a planting plan that Horne used to develop the final design. Paul’s project management skills and attention to detail during the construction process was critical in the successful implementation of this project. John Hoffman of Hoffman’s Nursery hosted the design team at the nursery and led a tour of the display gardens to aid in the selection of grasses. All grasses were purchased directly by Horne from Hoffman’s Nursery. This project is an excellent example of how collaboration, even at a small scale, is critical for the success of the built environment. Play Chastain, in the Buckhead community of Atlanta, is a new vision for how children explore and grow through the use of parks. 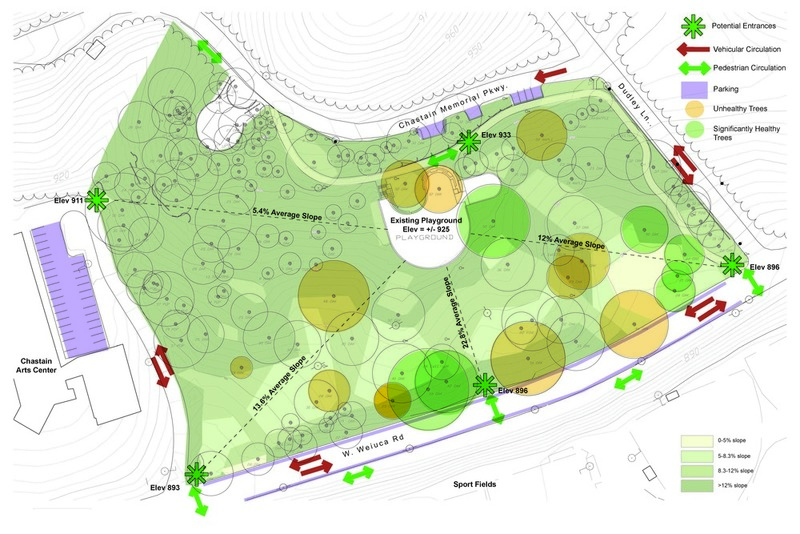 Jesse Turner, as Design Coordinator for The Natural Learning Initiative, worked with Harrison Design Associates, the Chastain Park Conservancy, and the Atlanta Task Force on Play to develop the design for this exciting new park. It features age group specific areas with developmentally appropriate features for all users, including care providers such as parents and grandparents. One of the most exciting features will be the tree house and super-long hill slides on Adventure Hill. This new park will be a wonderful addition to the already vibrant community that shares Chastain Park.